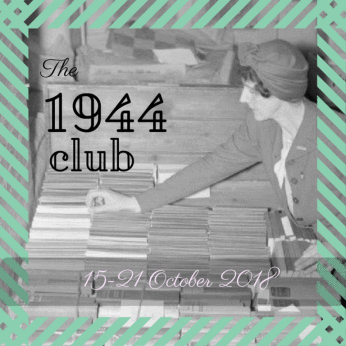 Since reading Margaret Irwin’s 1925 fantasy novel, These Mortals, a few years ago, I have wanted to read one of the historical novels for which she was better known – and when I discovered that Young Bess was published in 1944, I thought it would be a good choice for the 1944 Club Simon and Karen are hosting this week. 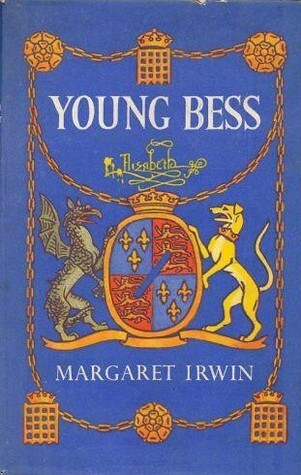 The ‘Bess’ of the title refers to the young Elizabeth I and this book (the first in a trilogy) covers her life between the years 1545 and 1553. Having read about Elizabeth several times before, I hadn’t expected Young Bess to offer anything new – and it didn’t, really; however, it was a pleasure to read a good old-fashioned historical fiction novel with elegant prose and strong characterisation, no present tense, no experimental writing and no multiple time periods! It’s a book which completely immerses the reader in the Tudor period and the lives of Elizabeth and the historical figures who surround her, so that you reach the end feeling that you’ve read something fresh and worthwhile after all. I loved it and will definitely be going on to read the other two books in the trilogy. The novel opens in the final years of Henry VIII’s reign; the King, now obese and in poor health, is as dangerous and unpredictable as ever, and his twelve-year-old daughter, Elizabeth – or Bess as I will call her for the remainder of this post – is already learning to navigate her way through the layers of political intrigue, betrayal and treachery that are part of everyday life for a Tudor. With the fate of her mother, Anne Boleyn, always at the back of her mind, Bess knows that nobody is safe at court and that fortunes can be made or lost in an instant. One of the few people Bess does love and trust is her stepmother, Catherine Parr, and she goes to live with her following Henry’s death in 1547. But then Catherine marries Tom Seymour, and tensions in the household start to rise when what seem at first to be innocent games between Bess and Tom begin to develop into something more. As the brother of Henry’s third wife, Jane Seymour, and therefore the uncle of the newly crowned Edward VI, Tom’s behaviour puts him in a precarious position at court. He lacks the power of his elder brother, Ned Seymour, who has been named Protector until the young king comes of age, but at the same time he is too powerful for his actions to be ignored. If he and Bess continue to pursue their relationship there could be tragic consequences. All of this will be very familiar to anyone who has read Elizabeth’s story before; as I’ve said, Margaret Irwin doesn’t really offer anything different or controversial (at least nothing that hasn’t been suggested by other authors as well). Where this novel really shines is in the characterisation – although Bess is the main focus of the story, all of the other characters feel fully developed too and because the book is relatively long for the short period of history that it covers, there’s enough time for the author to go into the necessary amount of depth. I particularly enjoyed the insights we are given into the thoughts of Henry VIII in the days before his death, the transformation of Edward VI from lonely, vulnerable boy to ruthless, calculating Tudor, and the appearance at court of the Seymours’ other brother, Henry, who is far more shrewd and observant than his unsophisticated exterior suggests. I suppose the war was never far from anyone’s thoughts in the 1940s, even when writing about the 16th century! I am now looking forward to reading the other two books, Elizabeth, Captive Princess and Elizabeth and the Prince of Spain. Has anyone seen the 1953 film version of Young Bess, starring Jean Simmons? I read this one long ago. Nice choice for the club! I was thinking about reading this one soon anyway, so I was pleased to find that it was published in 1944! Read all Margaret Irwin in my youth. Don’t remember this one well at all. I loved her books though. You have reminded me they may be worth a reread. This is only the second Margaret Irwin book I’ve read, so I have a lot to look forward to! Ha! Yes, that quote about the Germans does sound much more relevant to the 1940s than Bess’s time! Otherwise, it does sound good – I do like when authors simply tell a good story well, without a lot of style quirks and so on. And thank you for hosting it again. 🙂 I loved both of the books I chose to read. As I mentioned, my mother introduced me to Irwin young as this is one of her favorite books. We pilgrimaged to Hatfield House in April which I recommend if you have not been there. If ever there were a place to inspire time travel but we must not have had the right talisman . . . I wish someone had introduced me to Irwin when I was younger too. I wasn’t aware of her books until just a few years ago. And no, I haven’t been to Hatfield House, although it’s on my list of places to visit! I would like to see the adaptation now that I’ve read the book. It’s the original cover image, I think. More modern editions have the usual ‘girl in pretty dress’ covers, but I thought this one was more appropriate. This novel sounds fascinating, even if it doesn’t offer anything new, as you say. I would love to read it. I think I believe I saw that movie in my teenage years, or one with a similar title anyways; I was entranced. I really enjoyed this book – the writing was so good that it didn’t matter that I already knew the story. I would be interested in watching the film too.